Meet the Boss…the Sinkboss that is. 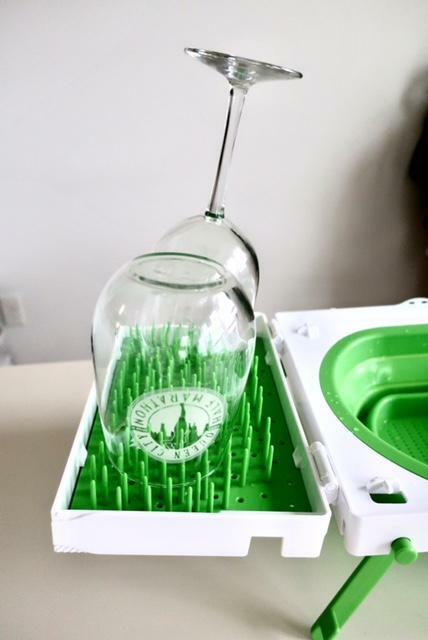 It’s a lightweight, compact, portable sink that creates a physical barrier between your bottles, breast pump parts, sippy cups, etc. and the sink basin or counter-top. Genius, right? 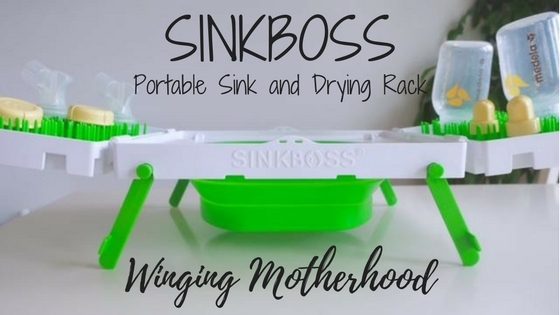 The first time I realized I needed something like the Sinkboss was when my husband and I traveled for the first time after our daughter was born. We were staying in a hotel and because of my oversupply I had to pump often on top of feeding her on demand. After pumping in the hotel I went to rinse everything out in the sink and realized I had nowhere to lay everything out to dry. Now, I mean no offense to the housekeeping staff, but I was leery to let my breast pump parts and bottles rest on the bathroom counter or towels. Think about it…it seems clean enough, but would you lick a hotel bathroom counter? Chew on a towel? I didn’t think so…but if you place the bottles on the counter that’s essentially what you’re doing. Even if the towels are clean, how many people handle them before they end up in your room? Maybe it’s the healthcare professional in me and the things I learned in my microbiology class (seriously, don’t ever swab your cell phone and put it on a petri dish to see what grows), but I am extra cautious when it comes to handling my milk, breast pump parts and bottles. What’s wrong with just using the sink? I don’t have a lactation room at work. No one before me has ever pumped in the office and there really isn’t any extra space to create a room for me. So I bounce around and use whatever office happens to be vacant, or go out to my car sometimes if there isn’t a free room. I’m lucky if I find a room with a door that locks, so I definitely don’t have access to a private sink or refrigerator. I love my coworkers, I do, but the employee break room sink is not an ideal place for washing breast pump parts or baby bottles. Not only does my milk provide nutrition for my own daughter, but I am a milk donor as well. This donated milk often goes to babies that are more susceptible to illness and disease. 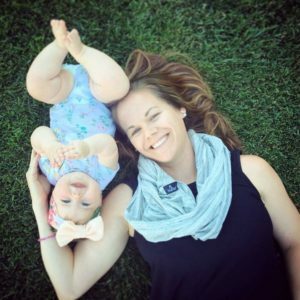 With the new CDC guidelines released last year, more awareness is being brought to the handling of breast milk and pump parts. Washing bottles and breast pump parts in the employee kitchen sink doesn’t fall within these guidelines. Sinkboss comes ready to use straight out of the box, no assembly required. Simply open up the side trays and lock into place. Push down the expandable colander (it accommodates most sinks) and wash your bottles, pump parts, etc. Then place them in the side trays to dry when you’re done. There are two ways to dry: on the counter top or with the included hangers. If you have the counter space, the legs that keep the side trays locked in place also act as a kickstand for the Sinkboss to keep it elevated up off the counter. Short on space? Use the hangers and hang from anywhere! If you’re in a hotel, the shower curtain rod works great. Camping? Hang it from a tree! The straps are adjustable so they can be used for hanging in free space or even against a wall, keeping the tray level. 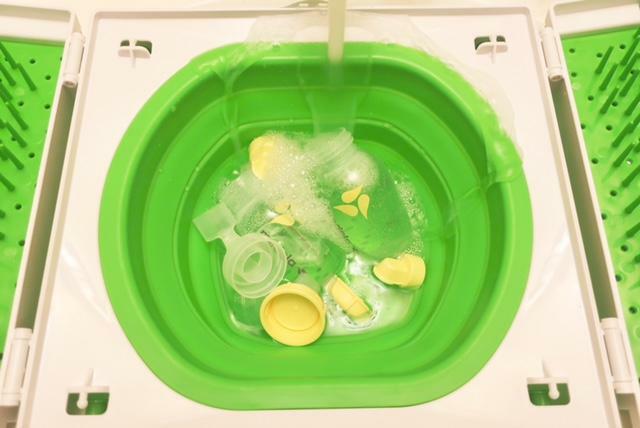 When you no longer have baby bottles and breast pump parts to wash, this can still be used for all kinds of kitchenware or anything that needs to be washed and air-dried when you’re on the go. 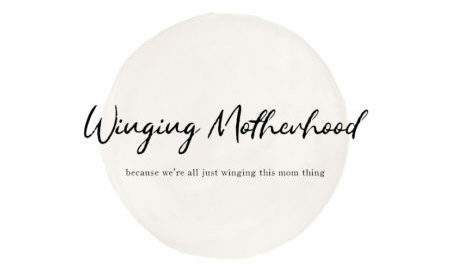 Now that I’m no longer pumping at work, it’s tucked away with our camping gear and is going to come in handy this summer. 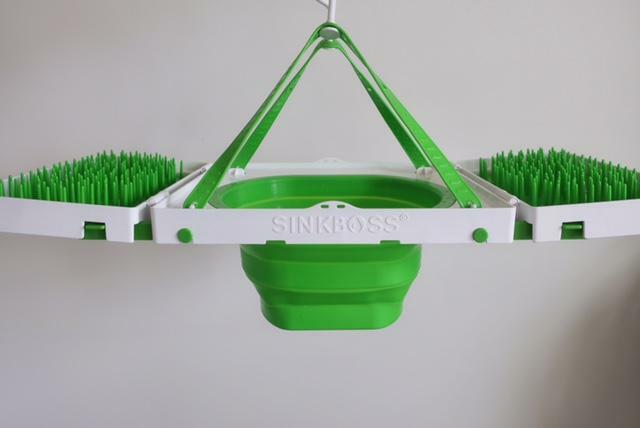 Sinkboss normally retails for around $50, but through January 31, you can snag one for just $35. Visit the Sinkboss site here for more details, or you can also find it on Amazon with free Prime shipping!